Colossal robots are frequent features of summer blockbusters. 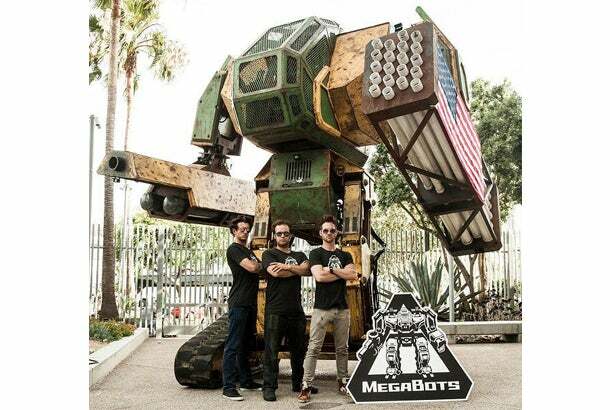 So it seems only right that, at the height of the hazy days of August, a robotics company called MegaBots has launched a Kickstarter campaign to generate the funds to build "the giant combat robot America deserves," and have it duel with another robot in – of course – Japan. So how did all of this come about? In June, two of MegaBots founders -- Matt Oehrlein and Gui Cavalcanti -- took to the Internet to issue a challenge to Japan's Suidobashi Heavy Industry, a self-described "organization which aims to spread human ride robots." The company "mass-produces" and sells giant robots called Kuratas, named after Kogoro Kurata, its CEO and founder. In their incredibly patriotic video, the founders of Oakland, Calif.-based MegaBots put it this way: "We have a giant robot, you have a giant robot – you know what needs to happen." Kurata accepted the challenge with a video of his own, saying "come on guys, make it cooler. Just building something huge and sticking guns on it. It's super American. We can't let another country win this. Giant robots are Japanese culture," and making hand-to-hand combat a part of his conditions. MegaBots is asking for $500,000 in 30 days to upgrade the Mk.II, its two-pilot, 15-foot-tall, 12,000-pound robot ahead of next year's battle. The team aims to update the robot's hydraulic system, make it move faster, and add some armor and "firepower" to the design. According to the campaign, raising a stretch goal of $750,000 would make it possible for MegaBots to build more weapons, while raising $1 million would allow the company to build a balance system to help the massive robot stay upright. If they were to go even further and raise $1.25 million, it would give them the means to connect with NASA "to see how NASA life safety systems might be used in the cockpit of the Mk.II," while raising $1.5 million would get the Mk.II a "Hollywood-grade paint job." Backers get perks that range from posters and t-shirts, to helping to test out the new upgrades and joining the pit crew on the day of the battle. Good luck, gentlemen -- your countries are counting on you.